These Hungarian-style paprika meatballs are amazingly juicy and full of flavour! Plus they are baked not fried! 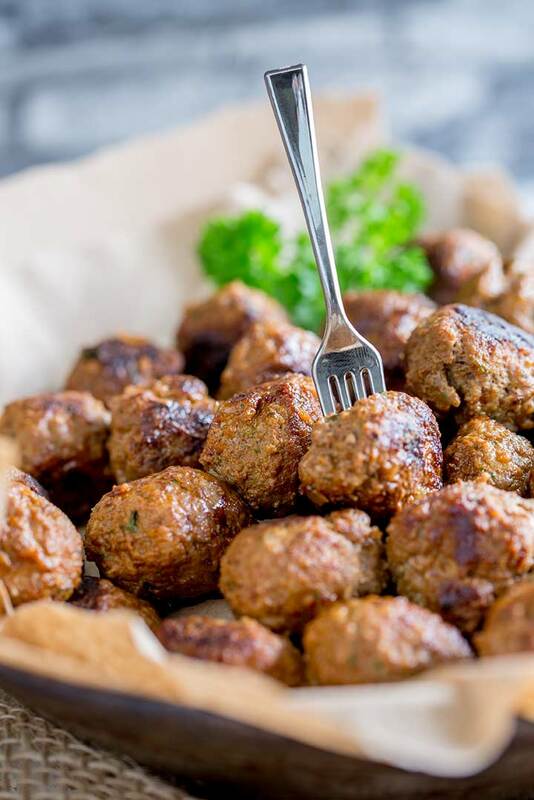 They are perfect for serving as finger food at a party, or mix your favourite marinara sauce with a little sour cream and serve these wonderful baked meatballs over pasta or spaetzle. Imagine biting into a juicy beef meatball, punchy with the flavors of smoked paprika and fennel. So juicy and tender, with a light crust. Imagine dipping it into a pillowy mound of sour cream, cool and refreshing. Now imagine watching others do the same. Before you know it the bowl is empty and the party is in full swing. Nothing gets people chatting and mingling like good finger food. The food you don’t have to put your drink down for. And these paprika meatballs fit that bill. Grab a mini fork or a cocktail stick, spear one, enjoy one and carry on your conversation. What is more instead of making the house smell of fried meatballs you can oven bake these babies! So oven baked meatballs is the easiest way to cook meatballs!!!! You can cook so many at once, making it perfect for a party! 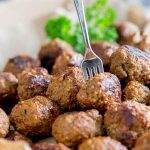 You can ensure they are all perfectly cooked through and most importantly you don’t have to stand by the stove cooking up batches of meatballs! I like to bake my meatballs at 400ºF/205ºC. This ensures they cook through and gives them a light crust without drying out. The ‘crust’ is important here, because without it the meatballs can fall apart when they are skewered. How long does it take to cook meatballs in the oven? If you make your meatballs bigger then they will need longer cooking. 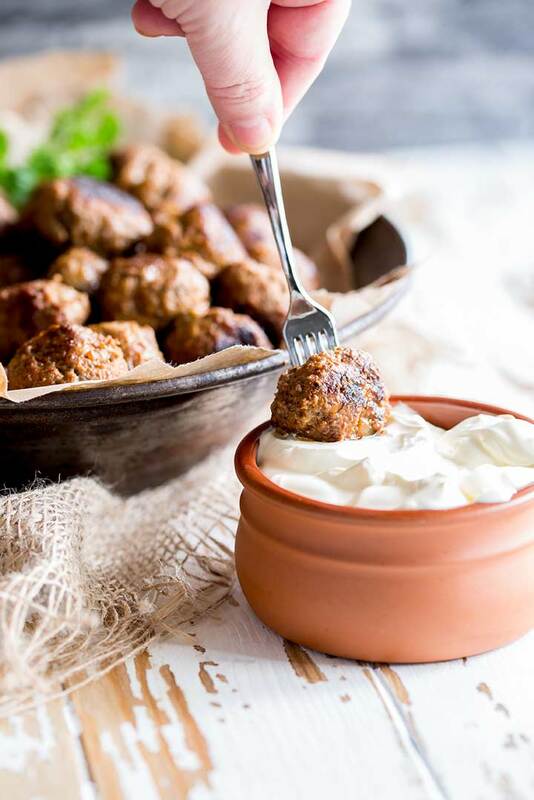 These paprika meatballs are packed with flavor so I like to serve them with a pot of sour cream. This continues the slight Hungarian feel and also works so well with the smoky paprika. 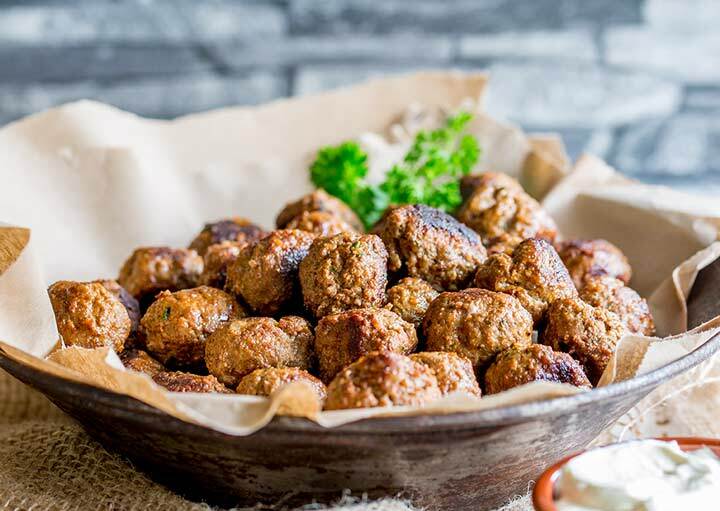 p.s If you are a big meatball fan then why not try these other meatball recipes that are perfect for serving as party finger food. These Hungarian-style oven baked paprika meatballs are amazingly juicy and full of flavour! Plus they are baked not fried! 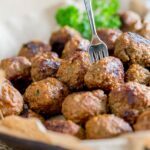 They are perfect for serving as finger food at a party, or mix your favourite marinara sauce with a little sour cream and serve these wonderful baked meatballs over pasta or spaetzle. Preheat oven to 400°F. Line a baking sheet by parchment paper. Grate the onion into a large mixing bowl and crush in the garlic. Bake for 10-12 minutes until cooked through with a light crust. I find if I lightly coat my hands with oil before rolling the meatballs, they will form a nicer ball and the mixture doesn't stick to your fingers. If you love food why not subscribe to my newsletter, I will drop you an email every now and then, just to say hi and send you a couple of recipes I think you might love, like these Baked Paprika Meatballs. They are flavors that just work so well together aren’t they. This is such a nice change from the typical meatballs in marinara sauce we usually eat! Thanks for a great recipe. 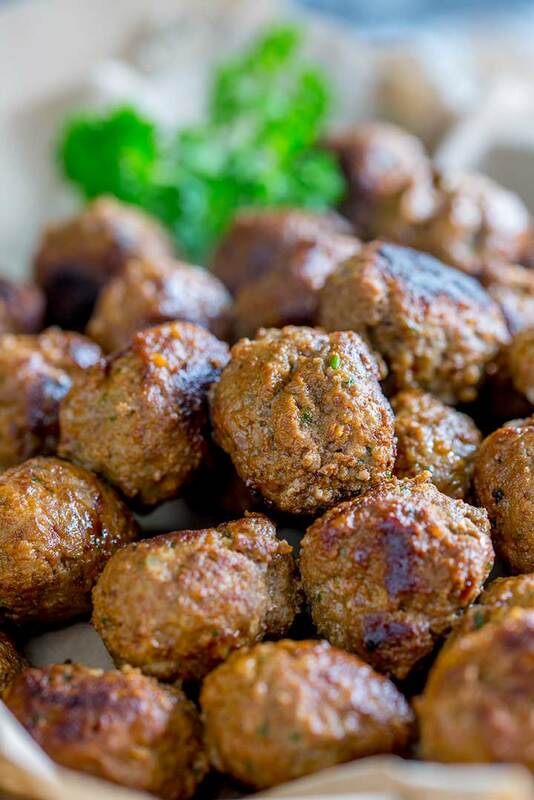 Well seasoned meatballs is always a key to success! And i absolutely adore the idea of adding sour cream as a dip, fantastic!